Nowadays more and more people cares about environmental-friendly goods. Ecolabeling is often used to distinguish such goods from regular goods. often they can't be trusted - companies like to place their own labels that states that product is friendly to environment to attract customers, but these labels are just a trick and has nothing to do with reality. So I would like to propose another approach. 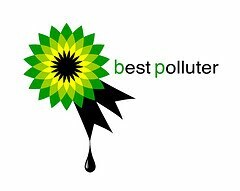 Do you remember BP re-branding after Deepwater Horizon explosion and infamous oil spill? I hope you do. What if we will oblige companies to put negative labels on the products which production causes significant threat to environment?! - A universal "eco-Black-Spot" for environment abusers! forged (self-made) "ecolabels" will instantly fail being alongside with the eco-Black-Spot. companies will try to wipe out an eco-Black-Spot from their products by actual contribution for preservation of the environment. m-m-m... I don't see any. Do you?